The President's Emergency Plan for AIDS Relief (PEPFAR) is the largest global health initiative focused on a single disease ever undertaken, and the United States is the first and largest donor to global HIV/AIDS efforts. 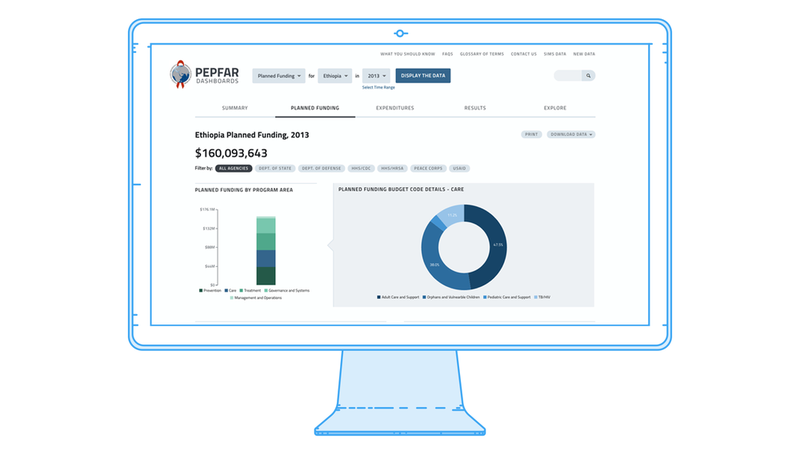 Our work on PEPFAR data dashboards helps achieve PEPFAR's top priority to provide transparency and helps illustrate the impact of PEPFAR programs around the world in fighting the HIV/AIDS epidemic. Persona details and project requirement details suppressed, as these are classified documents. In an agile team, I worked to create a basic site architecture, and then wireframes, using PEPFAR's four datasets as a guide. We designed the main navigation to use a "mad-lib" style sentence to select each dataset, country (or multiple countries), and date (or date range). Throughout, we emphasized use of plain language to help members of the general public to easily parse esoteric program names, epidemiological terms, and descriptions of activities. I took the lead in designing a two-way system for each of the datasets that first presented high-level scenarios visually, then offered drill-downs and more complex breakdowns for advanced users. The 2Paths team lead product development and technical architecture, and we worked together to flesh out acceptance criteria for each of the features. After completing the information architecture and wireframes, I transitioned to a quality assurance role to audit the content and visuals as the project proceeded into development. While I was not involved in the art direction, visual design, or front-end development, I designed interface navigation features (location and time pickers), charting components, and text elements throughout successive sprints of the project. Additionally, I also followed the project into a maintenance round for ongoing improvements post-launch and worked with DesignStamp and 2Paths to roll out additional visualization and content-management features.